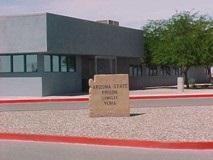 Arizona State Prison Complex Yuma is a correctional complex made up of five units;Cheyenne, Cibola, Cocopah, Dakota, and La Paz unit. Inmates can participate in a variety of education, treatment and work programs. One of the most coveted work programs at this facility is the wild land and fire crew which teaches inmates to fight forest fires. Inmates can also earn their GED and learn a variety of vocational skills. The visiting hours for an inmate incarcerated at Arizona State Prison Complex in Yuma will depend on what unit the inmate is currently in. General population inmates in all units will have visitation Saturdays, Sundays, and Holidays is from 8am-12pm, and the second block is from 12pm-4pm. The duration of the visit will depend on the inmates phase level. Cocopah inmates are allowed to have visits on both Saturday and Sunday. The non-contact visits for this unit are on Tuesdays and by appointment only, so you must call 928-627-8871 ext. 16324 several days in advance. Cheyenne inmates are allowed visits on Saturdays and Sundays and non-contact visits are on Tuesdays but you must make an appointment first by calling 928-627-8871 ext. 16624. Dakota inmates are allowed visits on Saturdays and Sundays. Non-contact visits are on Tuesdays and made by appointment only by calling 928-627-8871 ext. 16924. Cibola inmates can have visits on Saturdays and Sundays. Non-contact visits are on Tuesdays and by appointment only. To schedule a non-contact visit you must call 928-627-8871 ext. 17224. La Paz inmates are able to receive visits on both Saturday and Sunday. Non-contact visits are on Tuesdays and only by appointment. Call 928-627-8871 ext. 17524 several days in advance to schedule a visit.